Discover today Liège’s new tramway in video! 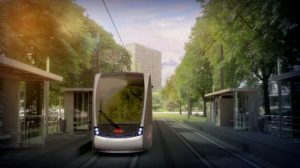 This video uses augmented reality and presents the future tram of the city of Liège. Lasting 10 minutes, it contains real views as well as virtual rendering inside and outside the tram. Made in collaboration with DreamWall and commented by Hadja Lahbib, host of the news report on RTBF, this movie will project you in the future. Watch the presentation video of Liège’s Tram in our VideoWall.